Our purpose is to promote deeper thinking about consciousness, explore the boundaries between mind and reality through experiments, and help expand our technological horizon. We're not aiming to prove anything; this is a fun and interesting investigation into a subject that millions of people care about. But what we find may impact our society by giving us a better understanding of what it means to say "we're all connected." For several decades, labs like Princeton University's PEAR lab and the Institute of Noetic Sciences have been exploring how human minds can have an unexplained influence on chaotic systems, such as devices called physical random number generators (RNGs). How this influence works is still a mystery, but it suggests that consciousness is more deeply connected to the fabric of reality than previously thought. New theories of consciousness are emerging that may help us to understand this mystery, and recently over 80 scientists (including a Nobel prize winner) called for more research into the field. Entangled is the result of 3 years of R&D. When downloaded, the app converts hardware functions on your phone into a physical random number generator. This is what creates the chaotic system that may allow the influence of your mind to show up on your phone. This data is uploaded anonymously to our servers, where we can create a living network of global consciousness information in real-time. Going a step further, the Global Consciousness Project has found some intriguing evidence that RNGs spread around the world will often register similar effects when global events synchronize the attention of millions of people, such as the attacks of 9/11 (below). Right: The combined output of global RNGs before, during, and after September 11, 2001.The odds that the overall Global Consciousness Project database is due to chance is less than one in one hundred billion. Even though we don't fully understand these mysterious mind-matter effects, we think we know enough about it now to develop the first examples of a radically new kind of "Consciousness Technology." A technology that works by harnessing the apparent connection between mind and the fabric of reality. What if video games could utilize the consciousness effects of players? What if location apps could display the average "emotional" impact of businesses and venues? What if art installations or concerts could tap into local or global consciousness data as part of the experience? Eventually we want to make an API for developers to correctly utilize consciousness technology, and for other creators to access this global consciousness data for their own projects. This app may help jumpstart the beginning of a fantastic technological future - one in which humans interact with computers or other machines in an entirely new way. This might bear upon ideas like the technological Singularity. Some organizations have claimed that mass meditation can have a small impact on the world... could an experiment with this app measure it? If mass consciousness effects are real, do they diminish with distance from a polarizing event, or do they follow more non-local principles? Does this shed any light on the wisdom traditions like Buddhism in the east, or Jungian psychology in the west? These are some of the questions we may start to answer with Entangled. Here's what we have planned for the initial app. Here you can explore how your own mind might be influencing the chaotic system created in your phone. The LIVE view is a graph of what your RNG is doing from moment to moment. The graph is the absolute deviation from the mean, but you can maybe think of it as a sort of personal "mind meter." The HISTORY view lets your data from previous days, as well as any interesting spikes that may have registered. Entangled can send you push notifications when "spikes" develop in your local data stream. 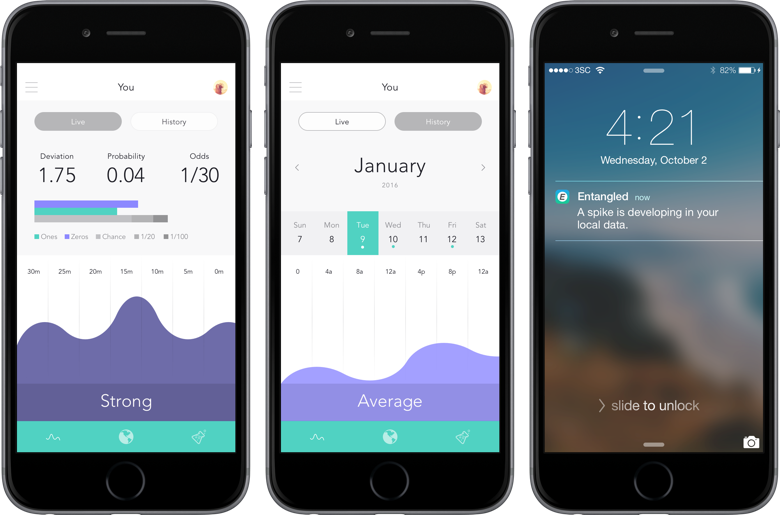 Do these notification correlate to your mental, emotional, or physical activities? You'll have to let us know! The GLOBAL view is a real-time picture of global consciousness data, overlaid on a browsable map. It's essentially an aggregation of individual RNG data from around the world. This screen can provide an intriguing look into what kind of "consciousness activity" is taking place both locally and abroad. The hotspots represent statistically-relevant covariance evident in the network within a recent time window. For example, if app users living in Paris were to collectively react to some meaningful event - in a way that impacted the RNG on their phone - this mass covariance may register on this screen. 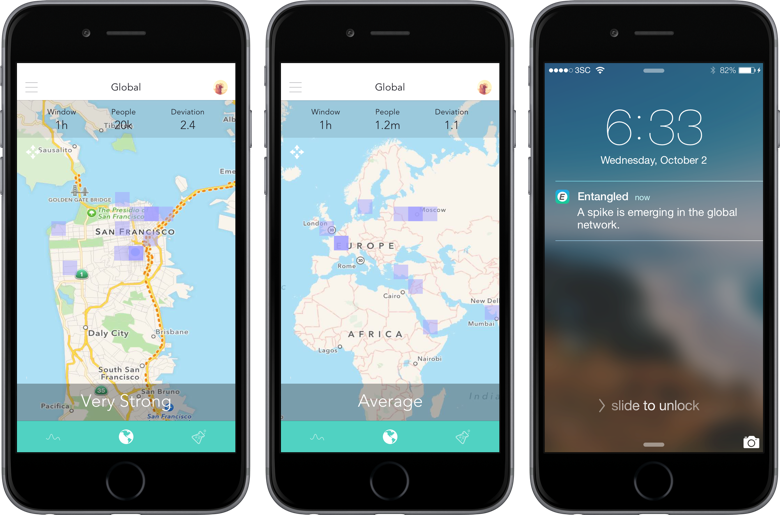 Entangled can also send push notifications when a "spike" in regional consciousness (network covariance) is detected for your city, your country, or the world. Note that this feature is not a formal experiment, but an interesting view into potential networked consciousness effects. Formal experiments will be carried out by our science team. See below. Mass Meditation: Can the effects of mass mediation actually be measured? Opt into the mass mediation experiment, in collaboration with Unify.org, and we can produce an answer. Earthquakes: Can thousands of people lend their subconscious minds to help predict earthquakes? This experiment will test the predictive capabilities of collective consciousness when it comes to future events of a predefined type. Terrorism: Terrorist acts polarize worldwide attention and cause an outpouring of emotion unlike any other event. Do anomalies in the Entangled network correlate with these acts? Does geography play a role? The LAB is also a place to access user experience add-ons, which we'll release in updates as they're developed. 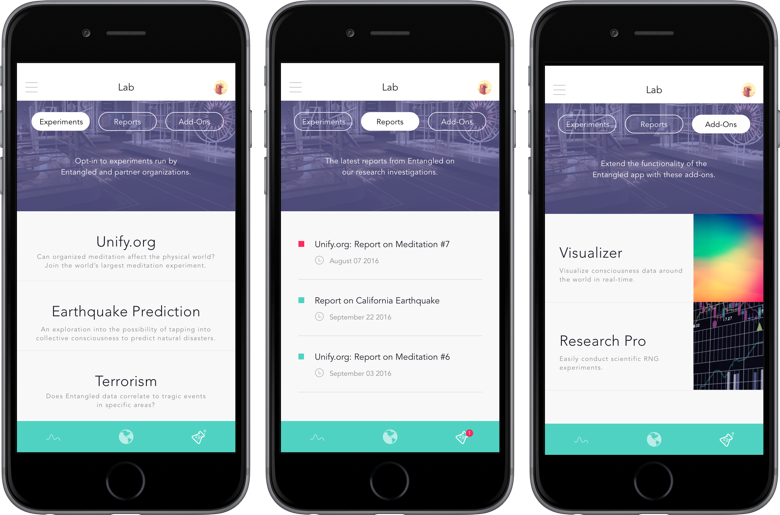 Look forward to tools for running your own experiments, visualizing local and global consciousness with sound and light feedback, and much more. If you think there may be more to reality than we've discovered, download the app and let's find out together. If you're fascinated by the power of intention, we hope to give you a hands-on experience. And if you're excited about the possibility of consciousness technology, tapping into the global mind, and creating a platform that could become the consciousness layer of the Internet, then you're one of us, and we're building Entangled for you! This app will be free, and is slated for release in early 2017. Follow us on Facebook or Twitter, and join our App Waitlist for updates.